Here is my submissions for this months' Wicked challenge. I did the first two parts of the challenge -- a square card and the color challenge (Rich Razzleberry, Pear Pizzazz and Tempting Turquoise). Not a color combination that I would naturally think of, but I think that it came up really nice! I do like the look and symmetry of square cards -- I think that I need to do more of these. 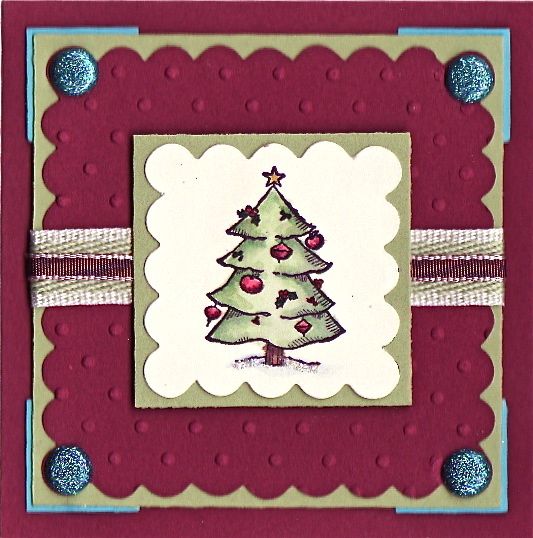 Go here to look at the WICKED Challenge Gallery at Splitcoast Stampers! Wow, this is beautiful. Love the colouring and the scalloped squares. An adorable card. I like those glimmer brads you used.